Navigate this holiday property using the Menu, or just browse down the page. 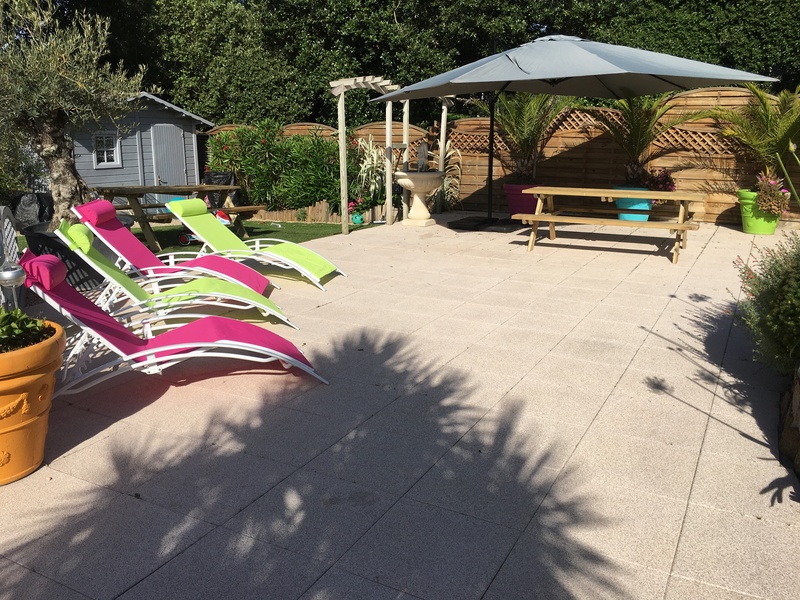 An ideal family holiday venue situated on the Vendee coast just outside lively resort town of Les Sables d’Olonne. 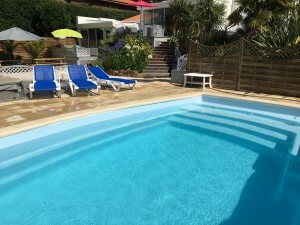 There are small coves within walking / cycling distance and in the hamlet of La Pironniere at just 600m you will find basic shops, a daily market in the summer, bars and restaurants. 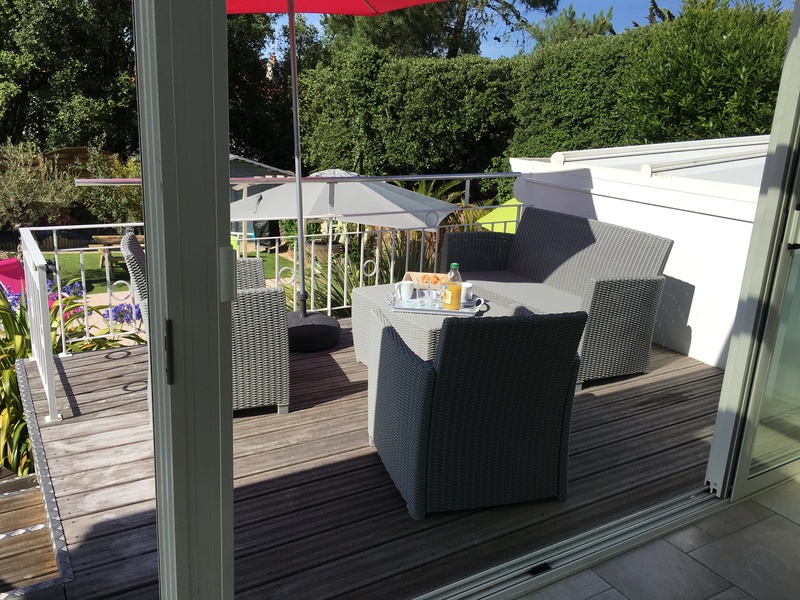 There is a larger beach and water sports centre Le Tanchet at 1.2km (0.75 miles) and the sea front and beach of Les Sables d’Olonne starts at just 3km (2 miles). The town centre is easily accessible by bicycle for further amenities, holiday activities and an endless choice of restaurants. 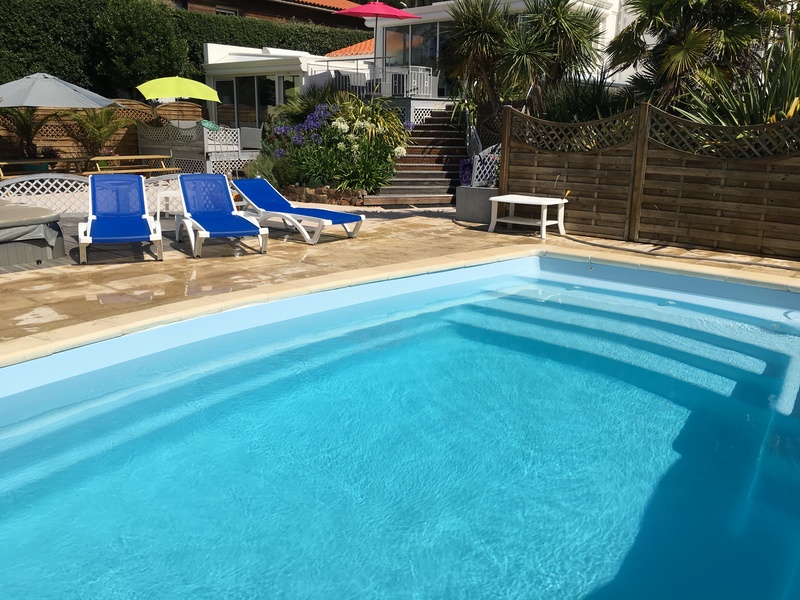 Villa Colombier offers excellent accommodation for two families holidaying together, being in two separate parts, each with two bedrooms, the total sleeping up to 9 people. Outside, each has an attractive deck area and there is a large terrace garden and a private heated pool. The pool has a sliding enclosure extending the swimming into early and late season. The nearby beach at Le Tanchet is a well known surfing spot and La Baie de Cayola offers superb cliff-top walks above the rocky coves. The surrounding area offers excellent cycling through the forests and the salt marshes and there are many signed trails along the coast. Local holiday activities include kiddies beach clubs, a paint-ball park, kite-surf and wind-surf, stand-up, sea kayaking, jet skis, scuba diving and a sailing school. Les Sables d’Olonne also has a zoo, a casino, night clubs, several museums, boat trips and the famous Spa centre. All on one floor. 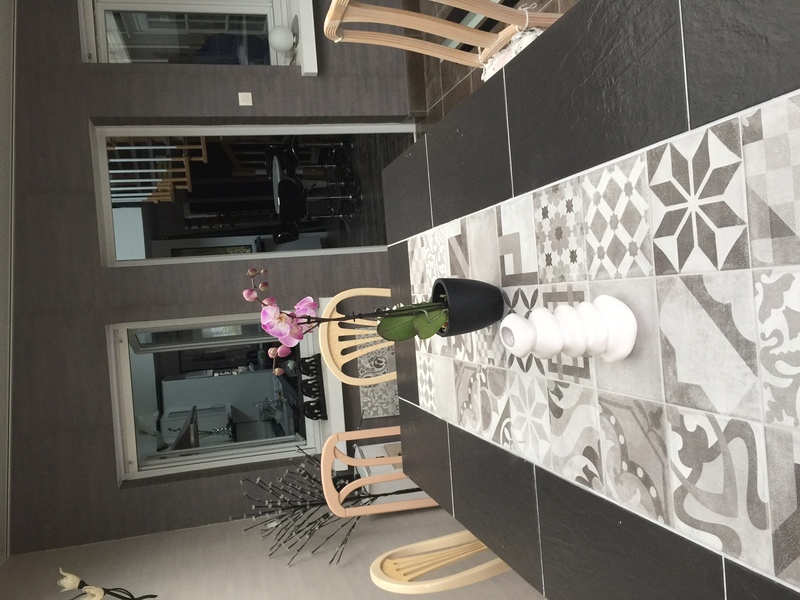 Large kitchen / dining room, leading to a veranda lounge-dining area. 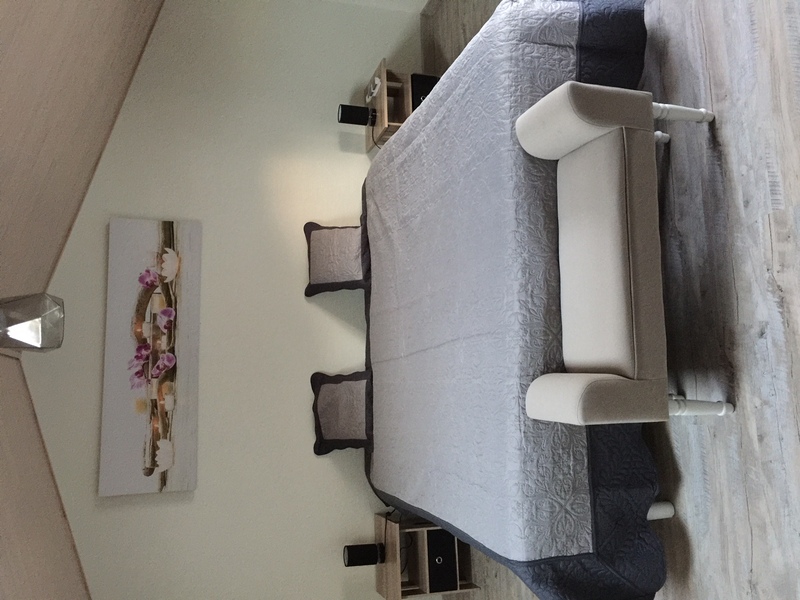 Bedroom with wide double bed. 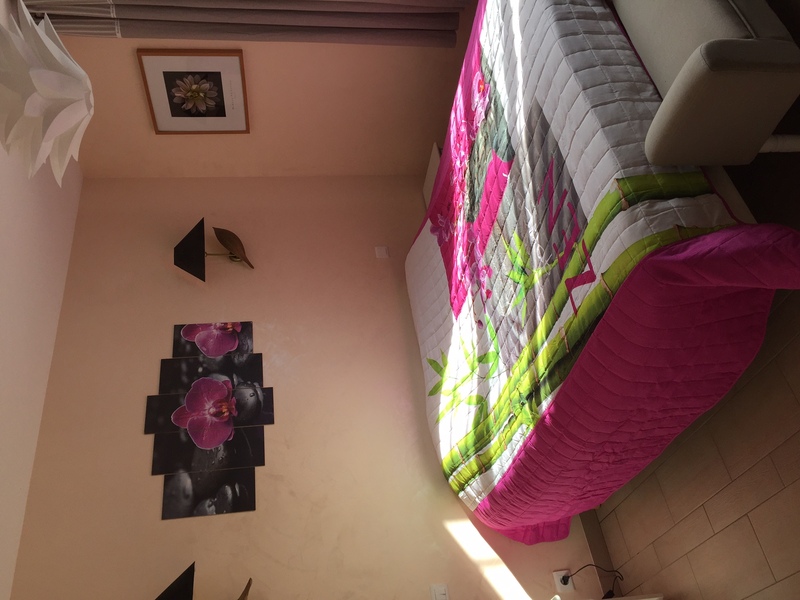 Bedroom with double and single bed. Convertible settee. Shower room with toilet. Deck with lounge furniture. Well equipped fitted kitchen (including dishwasher, microwave, large fridge/freezer, washing machine, etc.). TV and WIFI internet. On two floors. Attractive loft-style kitchen/dining room, leading to a veranda lounge/dining area. Bedroom with double bed. Shower room with toilet. Spiral staircase leading to first floor bedroom with wide double bed. (At the top of the spiral staircase there is also the connecting door to Part 1.) Deck with lounge furniture. 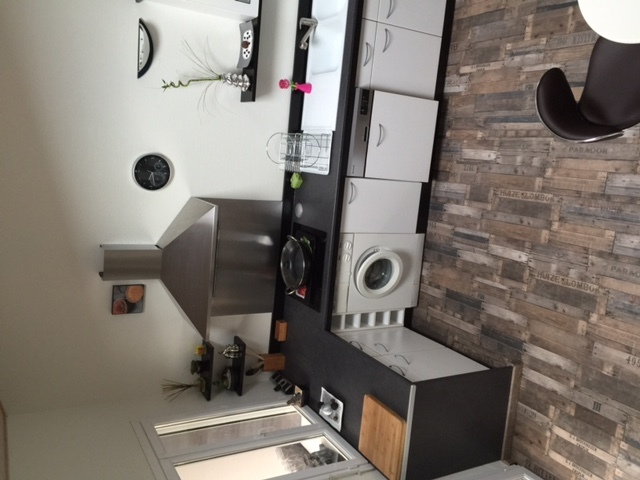 Well equipped fitted kitchen (including dishwasher, microwave, fridge/freezer, washing machine, etc.). TV (English and international channels), WIFI internet. Large paved garden, fully enclosed. 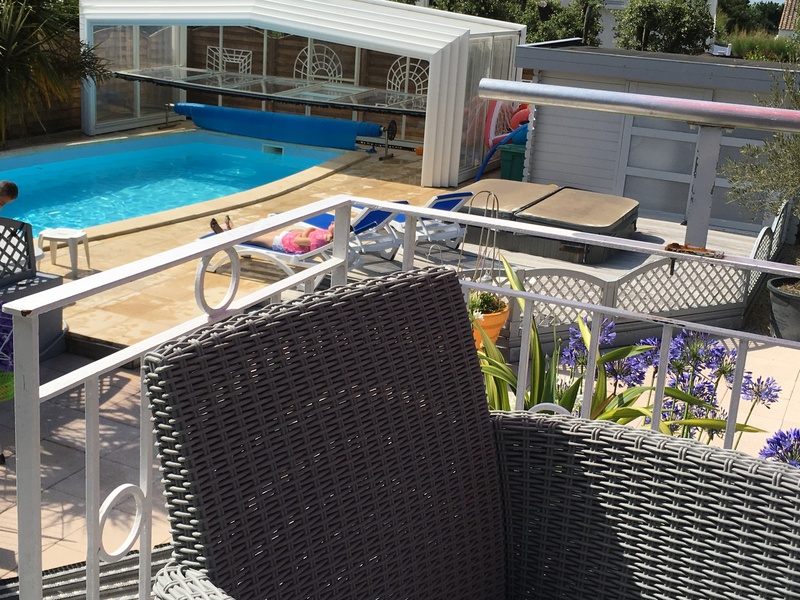 Private HEATED swimming pool 8m x 4m, depth 1.50m, with access steps. Sliding full enclosure, allowing under-cover bathing and providing child security when closed. Pool opening dates early April to end of September. Outdoor dining area. Sun loungers. Barbecue. Roadside parking (quiet residential road).